Looking for a Used Tribeca in your area? CarGurus has 244 nationwide Tribeca listings starting at $3,725. Although not as popular as its Outback cousins, the 2014 Subaru Tribeca offers one thing that the Outback doesn’t: 3 rows of seats accommodating up to 7 occupants. There’s also a lot to be said for the impressive number of features that come standard in the only trim, the 3.6R Limited. However, most reviewers are finding this 5-door midsize SUV starting to look elderly, and the well-wrought cabin to promote aesthetics over functionality. Cargo capacity, at 74.4 cubic feet with the rear seats folded, additionally reflects the Subaru lineup’s less-than-impressive hauling capacity, and average-size adults won’t be able to fit even close to comfortably in the pint-size third-row seat. Anyhow, only a couple of minor changes to standard feature availability are evident in this year’s Tribeca edition, much to the dismay of reviewers who feel this erstwhile ute could use a serious re-do. Meanwhile, standard all-wheel drive (AWD) remains one of the more popular draws for the entire Subaru lineup. Besides sending power to all 4 wheels all the time, this system allows extra power to be diverted to those wheels with the best traction in slippery conditions. Power for this feature-laden crossover, meantime, remains a 3.6-liter horizontally opposed 6-cylinder (flat 6) engine that comes under the auspices of the standard 5-speed shiftable automatic transmission to put out 256 hp and 247 lb-ft of torque. Alas, despite variable valve timing (VVT), mileage figures aren’t exactly world class, with estimates running 16 mpg city/21 highway. Towing, however, is maxed out at a fairly hefty 3,500 pounds, with the proper equipment. Standard appearance bling adorning the 2014 Tribeca 3.6R Limited includes 18-inch alloy wheels, a power sunroof, a roof rack and a rear spoiler, not to mention heated power-adjustable outside mirrors. Inside, look for leather upholstery, heated power-adjustable front seats and full power accessories, as well as leather and simulated alloy cabin accents. Of course, cruise control remains standard, as do tilt-wheel steering, a remote garage door opener and, for 2014, a standard rear-view camera that was optional last year. Additionally, tri-zone auto climate control comes delivered in this well-wrought crossover, as do an auto-dimming rear-view mirror and Bluetooth hands-free communications. And for entertainment, there’s a 385-watt stereo system boasting a 6-CD changer, 10 Harman Kardon premium speakers and satellite radio. A self-explanatory Navigation System & Rear Seat Entertainment System (RSES) package deal is one of the more popular option offerings in the 2014 Tribeca 3.6R Limited, with upgraded wheels, remote engine start, floor mats, cargo management equipment and all sorts of roof-rail configurations and containers also available individually. Finally, standard safety equipment of note includes 4-wheel antilock brakes (ABS), traction and stability control, 3-row head airbags and front head restraint whiplash protection. Daytime running lights and front fog/driving lights also come standard, as does a remote antitheft alarm with an optional shock sensor upgrade. What's your take on the 2014 Subaru Tribeca? 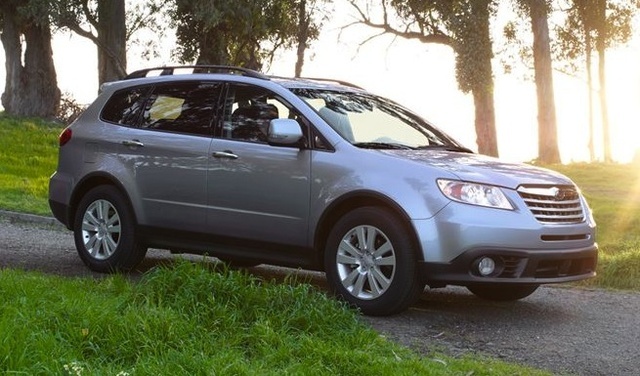 Have you driven a 2014 Subaru Tribeca? Would You Purchase An Orphaned Car?